Are you going for an official cricket tournament for your company? Are you aware of the fact that while playing you can be faced with any kind of injuries or accidents? But as you have some medical history related to your right hand, it is your responsibility to let your team coach as well as everyone accompanying you to the event about it through a Medical release. 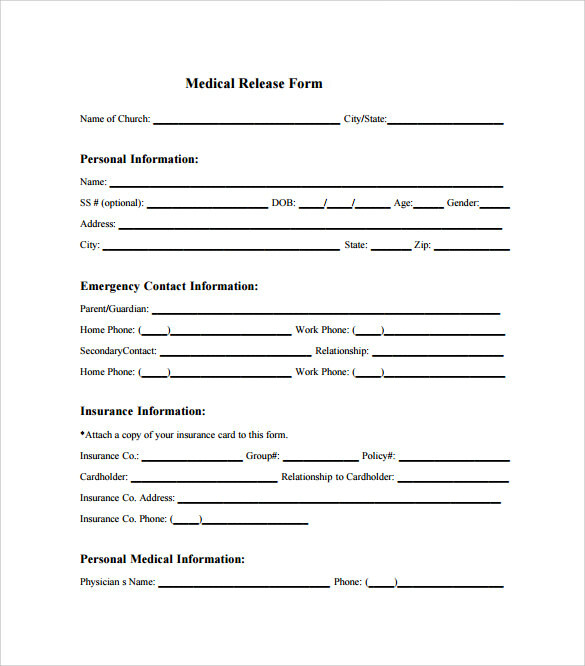 Not to worry as here you can find a huge collection of free printable Medical Release form absolutely ready to be used by anyone, to declare your Medical Consent Form if any emergency occurs. 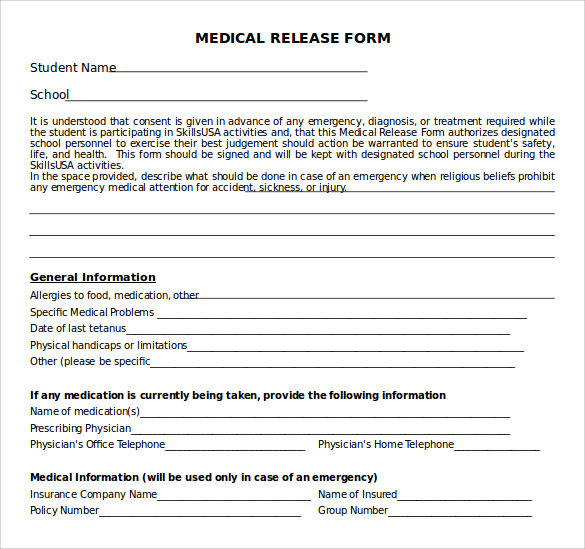 If you have gone for a sports meet, for representing your school, Then this generic Medical Release form template if downloaded will provide declaration that if any medical emergency occurs, then the school authority won’t be responsible, And if any medical history you have that should be mentioned here too. 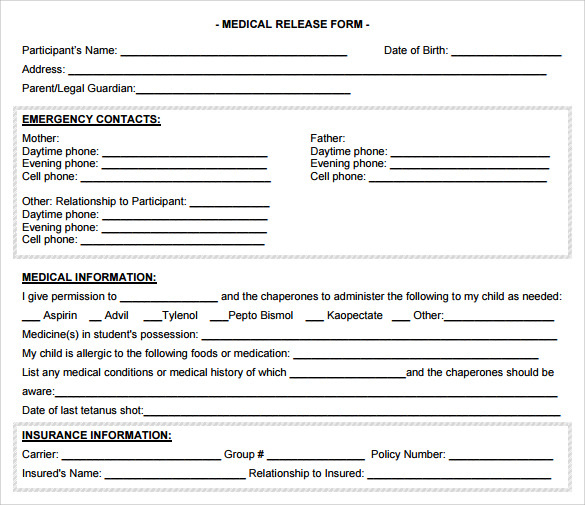 This Release for Medical form template can be downloaded by you as a parent for seeking permission for any kind of medical attention provided to your child on your absence if he/she suffers any critical injuries related to any unforeseen incident. Print this template; fill your details and use. 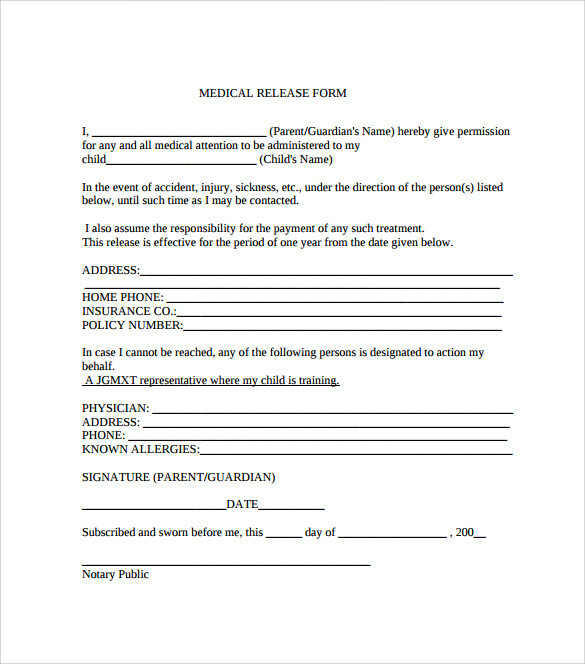 This template for Medical Records release authorization form can be downloaded free by you as parent to declare your medical consent when you are absent. You can provide your contact details and mention all the necessary medicines your child needs pertaining to his/her medical history and health insurance information. 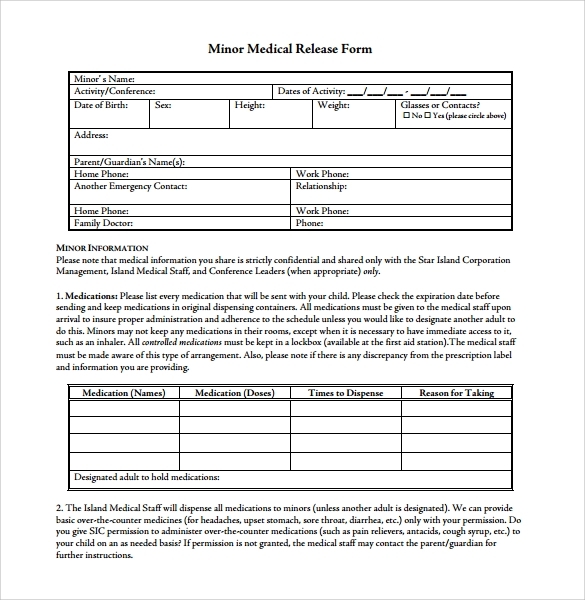 This template is available as Medical Release form in PDF format. Download and print it for use when participating on an outstation School trip. Fill up with your parent’s contact details, any other contact details, mention of any special medical condition if you have any and your health insurance details. When you are leaving for any official outstation trip or your minor is accompanying his school buddies for any interschool competition outside your state. While staying away if any kind of critical medical emergency occurs to you or your child, It becomes difficult for medical practitioners to provide immediate care if they are not aware about you. If you download free printable Medical history form templates by browsing the collection, you can provide the medical history, mention the list of medicines your are allergic to and provide the emergency contact details. This helps in faster initiation of the treatment process. If your child is good in any particular sports, he/she will have to go on for participating in competitions quite frequently. 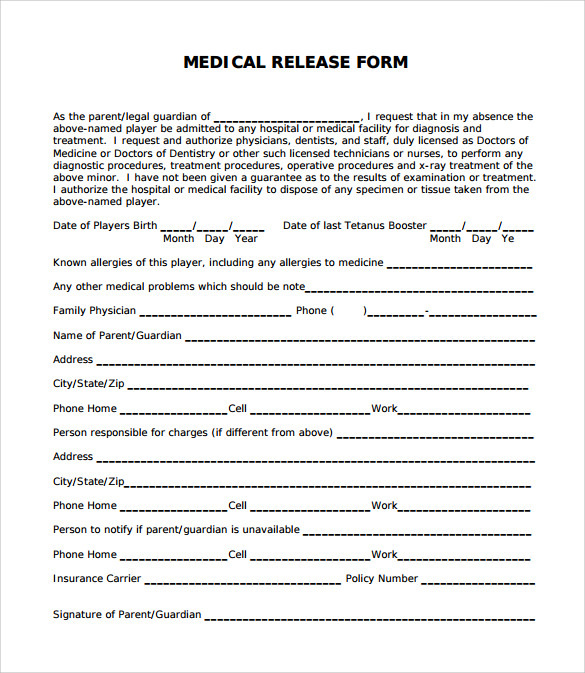 If your child has any particular medical condition, has any allergies pertaining to any food or medicine, then he/she must always carry a Medical Release form and Medical Consultation Form filled up properly from you as parents. These templates are designed to cater to everyone concerning their different needs for providing medical consent. 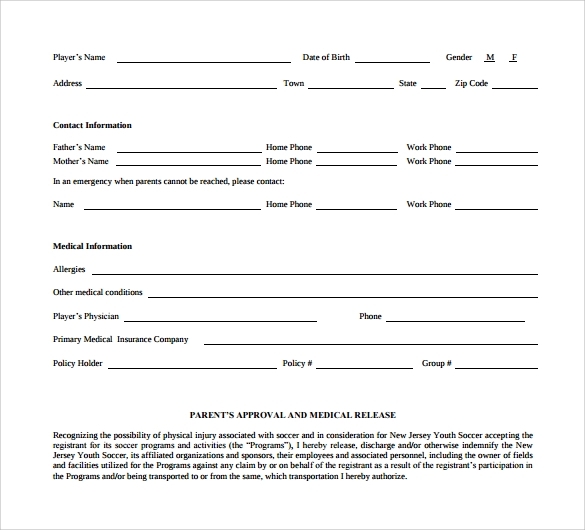 These templates are absolutely print ready and are extremely helpful in times of medical emergencies related to your child, your parents staying away from you and for yourself. If you have asthma because you are allergic to a lot of stuff and you have other medical complications too. But you must represent your college basketball team as you are a key player. 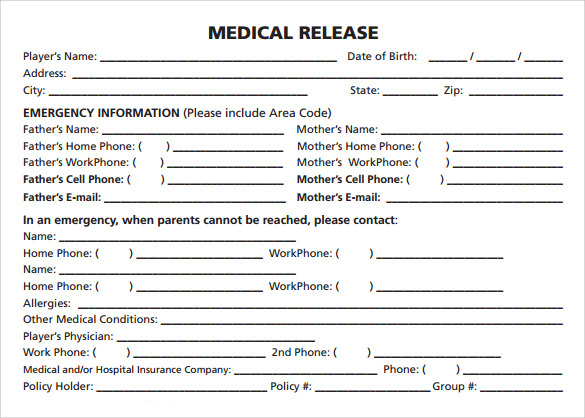 The Release Medical forms online templates from our collection can be downloaded absolutely free. You can then feed the form with your medical history, The contact details of your parents, mention any medical examination form you have appeared recently and also must mention your medical insurance details. 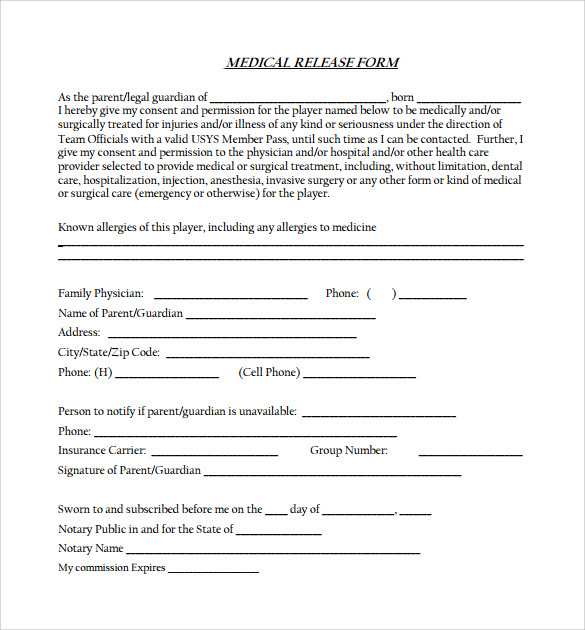 The doctors can immediately start treating you if any emergency occurs by looking at this printed consent form template. 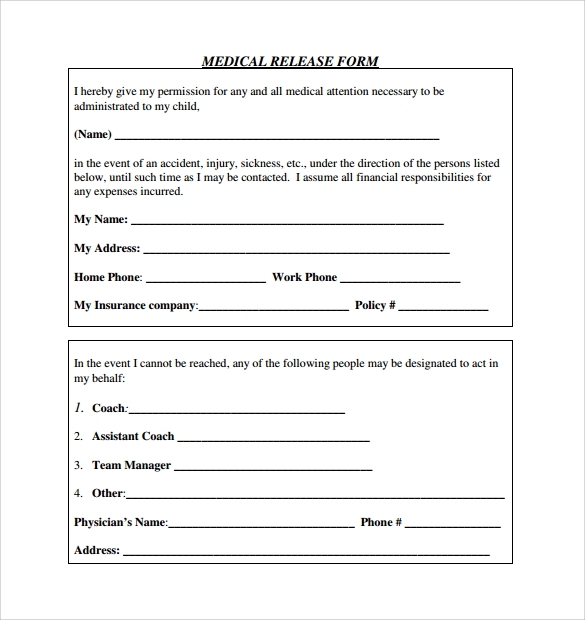 If your parents stay away, if you stay away from your family for your work requirements, if your child frequently goes for school trips, then it is always advisable to keep a Medical Release form updated properly. Hence, select, download, print and fill these templates to save your loved ones.